Good day, eh, and welcome to the Great White North. I’m Bob, and this is my brother Doug. 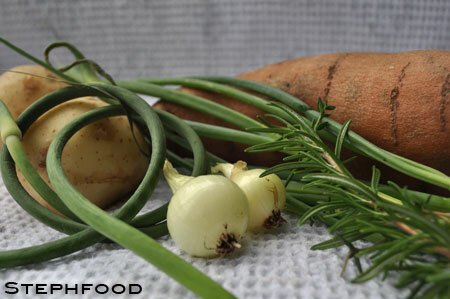 Our topic today, is, like, Great Northern beans and some great wild leeks, or ramps. How hard is it to identify a city’s cuisine? 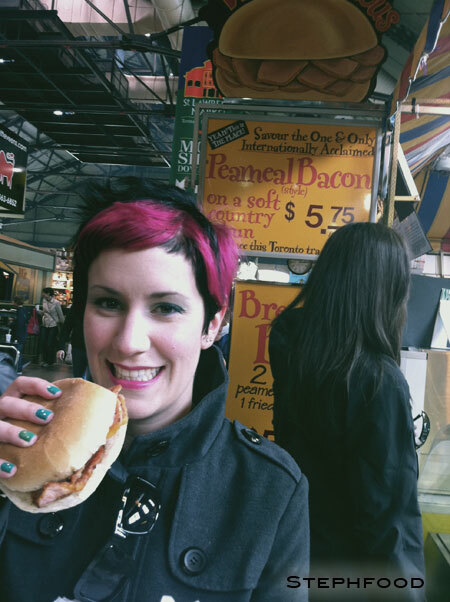 This is a story about how I found some Toronto food, and ate it. To end my little tour of Prince Edward county, I want to share a recipe that I cobbled together that was inspired by the spirit of the PEC. This dish is made up of seasonal, local ingredients – the cheese actually migrated back to Toronto with us, from Black River Cheese Company in Prince Edward County. 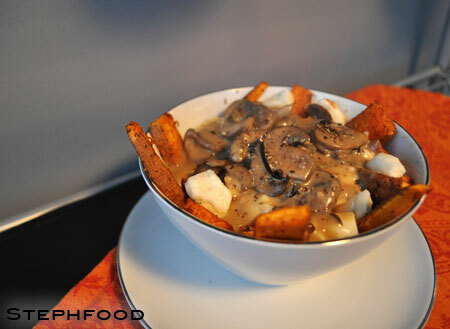 The idea for the recipe came from a combination of two things: the fancy pants poutine we had in Wellington, and the fact that I had bought some cheese curds and couldn’t think of anything better to do with them than make poutine. Since I had never made poutine before, this was a perfect opportunity. J suggested we do sweet potato, to change things up a bit – and it was a fantastic suggestion. A shameful admission from this proud Canadian girl, I haven’t really had much poutine in my life. Being a strict vegetarian for a good number of my adult years, I didn’t try poutine. To be honest, some of the poutines I saw weren’t even trying to change my mind – gloopy “gravy”, greasy fries and fake mozzarella doesn’t appeal to me. I guess it really isn’t that big of a surprise that it hasn’t been on my ‘to do’ list. Not long ago, J and I went to a fun tapas restaurant that focused on local ingredients, and we tried a really good unusual poutine. So when we saw it on the menu in Wellington – another poutine that stretched the boundaries – we happily ordered it. To be honest, I really should have tried to make it sooner. 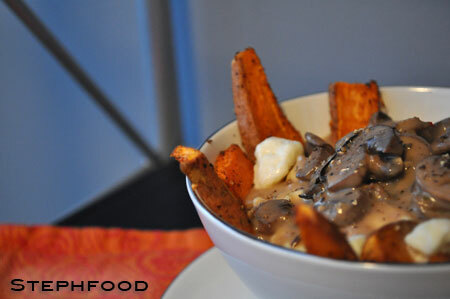 Not to rain on anyone’s grease parade, but making poutine at home can actually be healthy. The most fattening thing in the whole dish is the oozy cheese – and it’s oozy melty goodness is used to its full advantage when layered this way. The sweet potato ‘fries’ are baked with a little bit of oil, and some smart seasoning, and the gravy is vegetarian with only a bit of oil and some milk to add to the fat content. Compare this to the usual “heart attack in a bowl” that is traditional poutine. The verdict? It was amazing, if I do say so myself! The gravy was probably the biggest question mark, because I used a new recipe. I probably would use less milk next time – it tasted amazing, but am I wrong to think a milky coloured gravy just seems weird? It didn’t thicken as much as I thought – but it was thick enough for this, and not gloopy like you get when you thicken with corn starch. 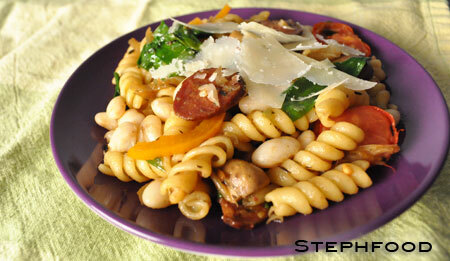 Finally – I try making some Canadian food on this blog!!! It only took nearly a year!! … and with this, I end my yammering about Prince Edward County (for a little while, anyway). The August 2010 Daring Cooks’ challenge is to make pierogi from scratch, highlighting flavours and ingredients from where you live. 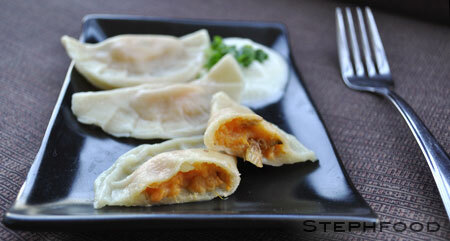 I grew up eating handmade pierogi from the Ukranian church around the corner from our house. They were fairly traditional, cheese and potato, and very good. I don’t think I realized how good they were until I started buying pierogi from the freezer section of my grocery store. Not quite so good, but edible. Years later, we found incredible pierogi from a vendor at St. Lawrence Market and we’ve been buying his ever since – saurkraut & mushroom, and jalapeno & cheddar. Amazing. I was tempted to try making saurkraut & mushroom pierogi for this challenge, but then I realized I probably couldn’t compete with the market guy and might end up disappointed. Instead, I chose to go with the ‘local flavours’ theme and use things that I could get from my garden or from the farmers at the market. 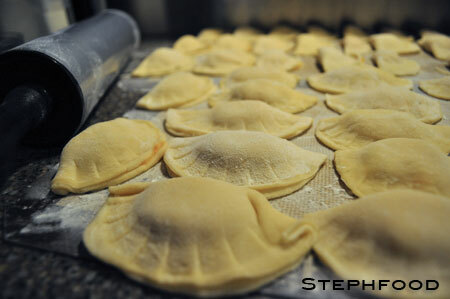 Today’s pierogi are filled with ingredients that are local to my home province – Ontario, Canada. I came up with a combination of potato, sweet potato, rosemary, crunchy garlic scapes, Canadian old white cheddar and onions caramelized in maple syrup and Ontario beer. This combination of flavours is more like what I would have in the Fall, but all of these things are fresh and local now. I was really happy with how the filling turned out. I could taste the hint of maple syrup and beer, I could feel the slight texture added by the garlic scapes, the woodiness of rosemary and thyme, and the creaminess of the blend of potatoes. With that taken care of, I had to tackle the dough. 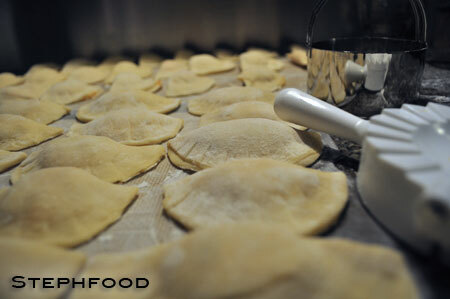 I’ve made fresh pasta before, but that dough is drier and I found the pierogi dough to be more difficult to handle. The dough was very sticky, and I had to add a LOT more flour to it. Apparently, this isn’t the way to do it — you’re supposed to slowly add the water to the flour and monitor the texture of the dough in the early stages, so you don’t have to try to ‘correct’ it with more flour later on. I’m learning as I go. I had a bit of trouble rolling out the dough – the gluten had been worked enough to make it pretty elastic, and it wasn’t easy to roll it out thin. As a result, some of my pierogi were thinner than others. We also had quite bit of the filling left over when we were done. I could have made another batch of dough, but instead we made croquettes with it the next night. I always enjoy these kinds of meals. It’s a great project on a rainy day, and I find it almost therapeutic as you get into the process. Roll out the dough, cut the circles, add some filling, fold it over, pinch. Lather, rinse, repeat. It’s a great break from the computer. In the end, the pierogi were declicious, imperfections and all. We topped them with some thick Balkan-style yogurt and green onions. I took half of the batch and froze it, so we would have some to enjoy later. We’ll see how well they freeze — I have a feeling they’ll be just fine, and I’ll be happy to enjoy the results of my hard work for a second time!